“Israel Hayom” newspaper, on Wednesday, unveiled an official Israeli document, issued by the Israeli Ministry of Foreign Affairs, which denies the existence of millions of Palestinian refugees. The document affirms the need for settling the refugees residing in Jordan. It also claims that there are links between the UN Relief and Works Agency for Palestine Refugees (UNRWA) and Hamas, saying that the agency is exaggerating the number of refugees and blurring the facts, in order to keep the refugee issue instead of resolving it. According to the PNN, the document considers that the “refugee” classification applies to a very limited number of Palestinians, the same position expressed by the US administration in a report, recently, which states that there are only “tens of thousands of Palestinians refugees” only, instead of the 5.3 million refugees registered with UNRWA. The document referred to UN General Assembly Resolution 149, which states that refugees should be returned, claiming that the resolution is non-binding and that the General Assembly does not have the capacity to commit to decisions, but only recommendations. Through the document, Israel called on the European countries to amend what it called a “historical mistake” of granting UNRWA a mandate related to Palestinian refugees and their attachment to the United Nations refugee agency. The 1948 Nakba and its ethnic cleansing that led to change in the population of Palestine and control over the land set a de facto situation imposed by the power of an occupying force whose results has continued with the continuation of the occupation of the land and failure to implement international resolutions on the return of refugees. The Nakba and the dispossession of more than 800,000 Palestinians from their villages and towns out of the 1.4 million Palestinians who lived in historic Palestine in 1948 in 1,300 Palestinian villages and towns was the beginning of the suffering of generations deprived of their right to their land who have become to be known as refugees until their return. The official estimate of the number of Palestinian refugees on the eve of the 1948 war goes back to various sources. However, the United Nations has two estimates: the first indicates that the number of Palestinian refugees reached 726,000, based on estimates from 1949, and the second 957,000 based on the 1950 estimates. According to the annual statistics of the United Nations Relief and Works Agency for Palestine Refugees in the Near East (UNRWA) 2018, the number of official Palestinian refugee camps recognized by UNRWA is 12 in Lebanon, 10 in Jordan, 9 in Syria, 19 in the West Bank, and 8 in the Gaza Strip. The number of refugees registered with UNRWA in 2017 was 5.9 million, representing the minimum number of Palestinian refugees. The Palestinian refugees residing in the West Bank registered with UNRWA in 2017 accounted for 17% of the total number of refugees registered with UNRWA, compared to 24.4% in the Gaza Strip. In the Arab countries, the percentage of Palestinian refugees registered with UNRWA in Jordan was 39.0% of the total Palestinian refugees, while 9.1% in Lebanon and 10.5% in Syria. According to the Palestinian Central Bureau of Statistics (PCBS), the number of refugees in 2017 represents 43% of the total population in the State of Palestine, and 26.6% of the population in the West Bank are refugees, while the percentage of refugees in the Gaza Strip is 66.2%. The statistics indicate that the Palestinian refugee population is young, with 39.9% of the total population in Palestine in 2017 are below 15 years of age, which is 39.3% of the total refugee population, and 38.6% of total non-refugees. The percentage of elderly persons aged 60 and over was 4.9% of the total refugee population in the State of Palestine, while the percentage of non-refugees reached 5%. According to the report, the proportion of disability / difficulty among refugees is more prevalent, with 6.8% of Palestinian refugees suffer from disability / difficulty compared to 5.1% among non-refugees. It was found that individuals with disability / difficulty in sight rise among refugees compared to non-refugees, with 3.1% and 2.3% respectively, while the percentage of people with disability / difficulty in movement among refugees was 3.5% compared to 2.5% among non-refugees. The Labor Force Survey of 2017 showed that the participation rate in the labor force was 45.3%, with 45.2% among refugees aged 15 and over residing in Palestine compared to 45.3% among non-refugees and the unemployment rate among refugees is 34.7% compared to 22.8% among non-refugees. One third of the refugees are employed as professionals, technicians, assistants and clerks. These occupations are the most accommodating for refugees, with 32.8% of working refugees compared with 22.4% among non-refugee workers. 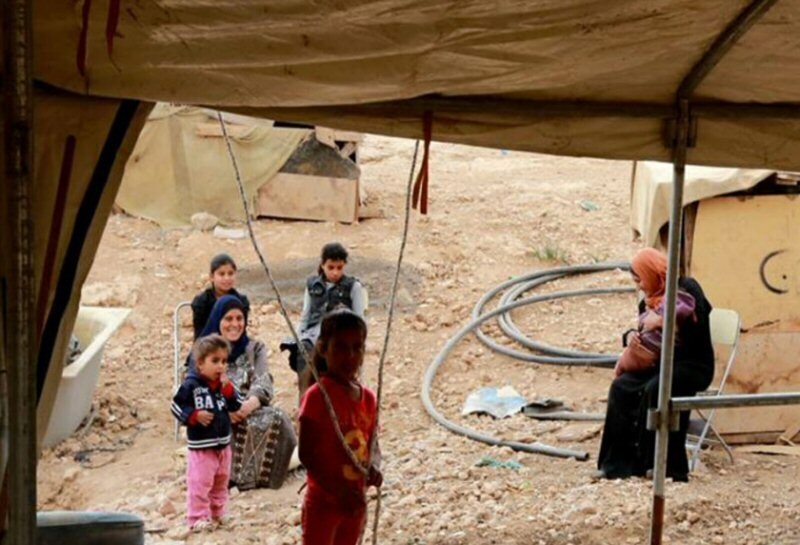 As for the situation of the Palestinian refugees in the diaspora, a study prepared by FAFO on the living conditions in the Palestinian camps in Jordan in 2011 indicated that 39.9% of the camp population is under the age of 15 years and the average size of the family in the camps was 5.1, and the illiteracy rate among individuals aged 15 and over was 8.6%. The results of the general census of Palestinian refugees in the Palestinian camps and gatherings in Lebanon for 2017 show that they are based in the Sidon region at 35.8%, then in the North by 25.1%, in Tire 14.7% and in Beirut 13.4% Chouf 7.1% and then the Beqaa region by 4%. The results indicated that about 4.9% of Palestinian refugees have non-Palestinian nationality. Street in Bezons named 'in memory of the expulsion of 800,000 Palestinians and the destruction of 532 villages in 1948 by war criminal David Ben-Gurion'; following protest from Israel, French government orders street signs removed. 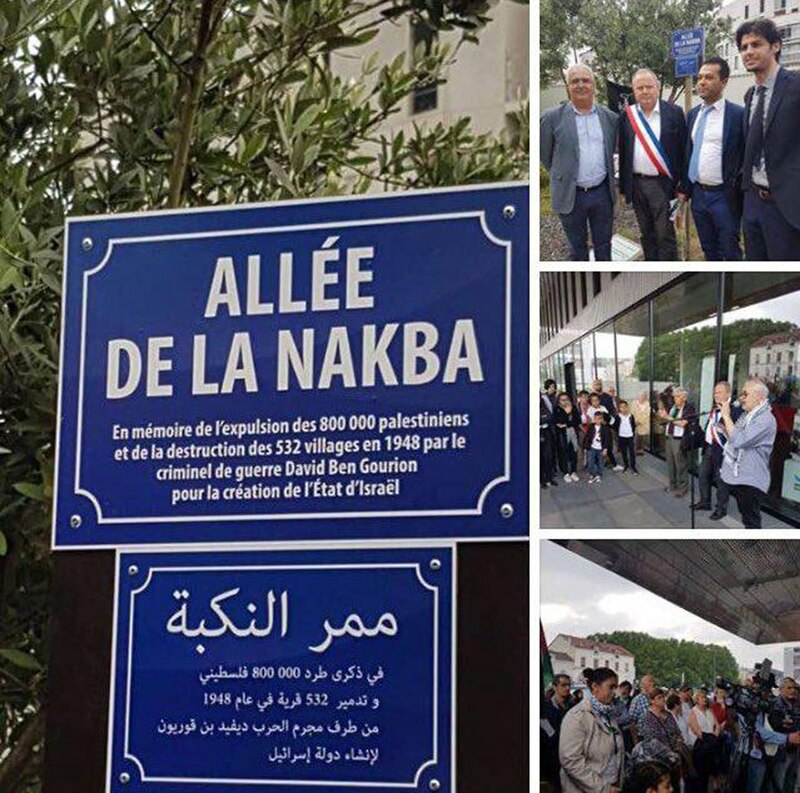 Bezons, a French commune in the northwestern suburbs of Paris, has named a new street "Nakba Avenue" in a ceremony attended by city leaders and representatives of the Muslim community. The new street sign explains it was named "in memory of the expulsion of 800,000 Palestinians and the destruction of 532 villages in 1948 by war criminal David Ben-Gurion"—Israel's first prime minister. Bezons Mayor Dominique Lesparre, a member of the Communist Party, is behind the initiative. This isn't the first time Bezons shows solidarity with the Palestinian people. In 2013, it conferred honorary citizenship to Majdi Rahima Rimawi, one of the murderers of minister Rehavam Ze'evi. Rimawi was sentenced to life in prison and an additional 80 years. Israel's Ministry of Foreign Affairs spokesman Emmanuel Nahshon called the "Nakba Avenue" initiative "a nauseating act," which "encourages Palestinian terror and positions itself against peace." "Not for the first time (glorification of Palestinian murderers seems to be their hobby)," he added. "Shameful and ugly." The signs for the new avenue have since been removed at the instruction of the French government. Israeli soldiers shot, Tuesday, two Palestinians with live fire and 71 with rubber-coated steel bullets, in addition to causing approximately 100 to suffer the effects of teargas inhalation, and abducted two others, in Nablus governorate, in the northern part of the West Bank. Medical sources said the soldiers attacked hundreds of protesters, who marched in the al-Lubban ash-Sharqiya village, and near Huwwara military roadblock, south of Nablus, marking the Palestinian Nakba, and the ongoing illegal Israeli occupation of Palestine. 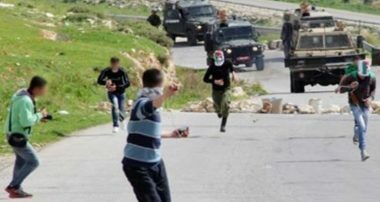 The soldiers also attacked protesters in Beita village, south of Nablus, in addition to Azmout and Beit Forik, east of Nablus, and Deir Sharaf, west of the city. Ahmad Jibreel, the head of the Emergency Unit of the Red Crescent Society, said the soldiers shot two Palestinians with live fire, and 69 others with rubber-coated steel bullets, in addition to causing approximately 100 to suffer the effects of teargas inhalation. The soldiers also abducted Mohammad Nubani, 23, and Kamal ‘Oweiss, and took them to an unknown destination. Also in Nablus, several extremist Israeli colonialist settlers cut several Palestinian olive trees near the main entrance of Burqa village, north of the city. Many Palestinians then gathered in the area, before the soldiers invaded it and fired several live rounds and gas bombs at them.